It’s one of my favourite places on earth. the memories are inspiring and will lead to great things tomorrow. Maybe. The Maōri called it Titea, which means Glistening Peak and at 3033m high it’s well beyond my vertigo tolerance or walking capabilities. 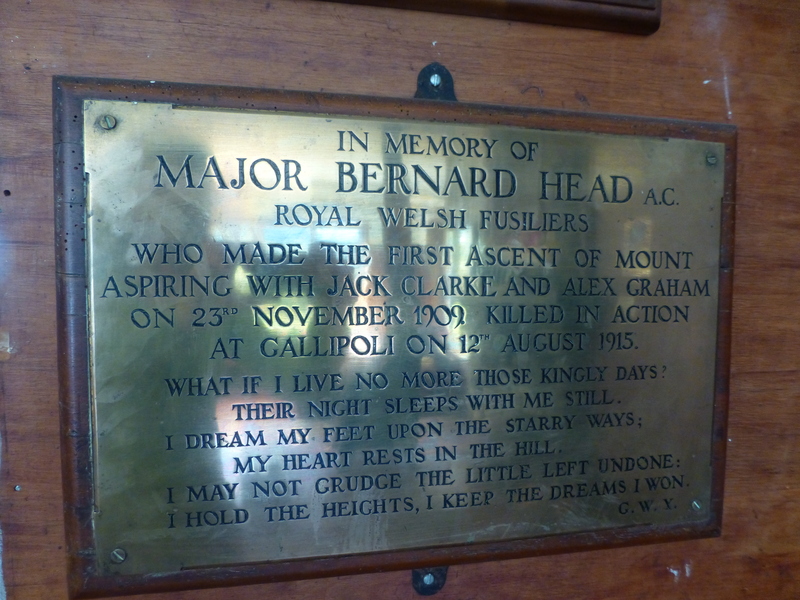 But not those of Major Bernard Head, a Welsh soldier who died, like so many others, at Gallipoli a few years after being the first to climb the mountain just over 100 years ago. There’s a plaque to his honour in the Aspiring Hut where we dried off and slept last November after the glorious but squally walk up the glen. I’ve just watched some modern videos of the mountain and discovered that many climbers now hitch a lift in a helicopter up to the last couple of steep faces, yet it’s still a stunning achievement to reach the summit. Major Head and his companions must have been hardy men. 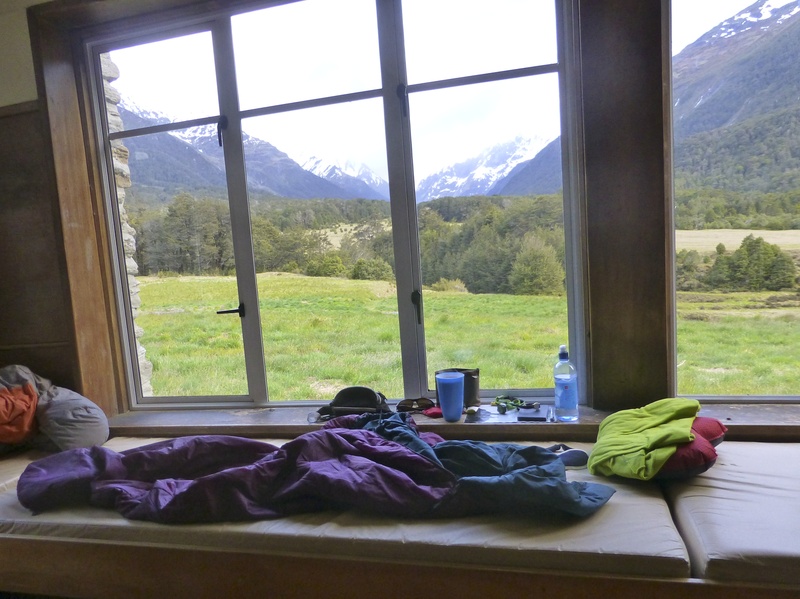 The view from my “bed” on waking up in the Aspiring Hut has to be one of the best ever and only matched by unzipping a tent flap and peering out at lochs and hills in the wilds of Scotland. 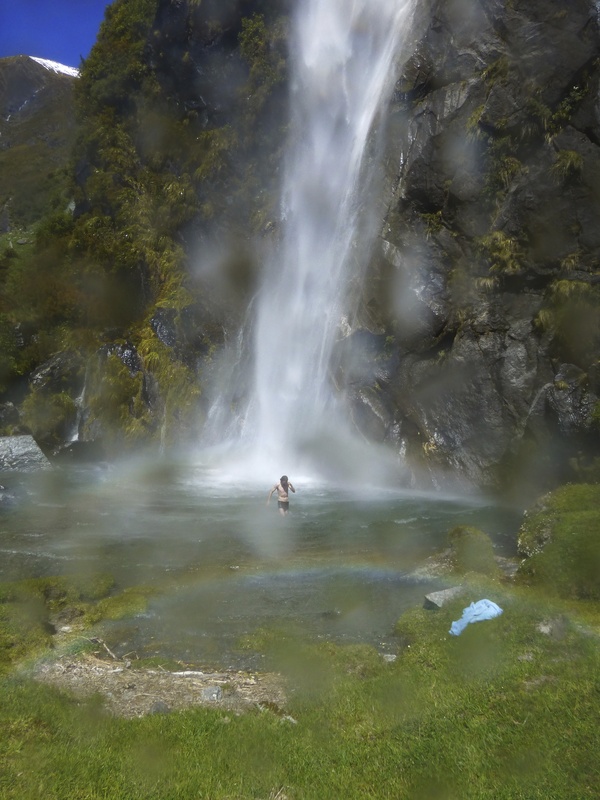 And I’ve only ever walked a couple of hours towards the mountain but I want to return and explore further up the valley past the waterfalls that create Arctic swimming pools. Even the lower ones are irresistible. For a short time at least. The Mount Aspiring National Park is home to the famous Routeburn Track, one of New Zealand’s Great Walks in the Southern Alps. It takes 3-4 days to make the hike which has a series of well-spaced huts. I walked the Routeburn 27 years ago, carrying not only a pack with all my gear but also a five month foetus all the way up to the 4500ft divide. I hope he appreciated it. What a fantastic photo of the falls with that rainbow!! Great capture!